We are now back in Chiang Mai, where we will stay for about 2-3 weeks. We stayed in Bangkok for about a week, but mostly stayed inside, due to the protests! We managed to get to see a few sights, including some of the temples, such as Wat Pho and Wat Phra Kaeo. 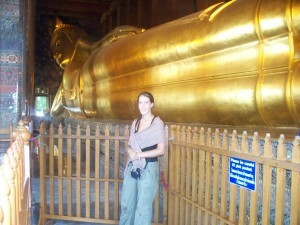 Wat Pho is famous for it’s reclining Budda, which is 47 meters long and 15 meters high. This is very impressive to see! When visiting the temples make sure you are covering your arms and legs, as you will not be allowed to enter! We also visited China Town and a few parks, including Lumphini Park,which was hit by the protests the We would of liked to see more, but with all the protests going on at the moment, it was safer to stay inside! We were staying at the @ Hua Lumphong hotel, which we have stayed in every time we’ve been in Bangkok. The rooms are really comfortable and the hotel staff are extremely friendly! There is a living room area for guests to use, where you can sit, chat, relax and watch TV. There is also a beautiful little Cafe downstairs, with excellent food and warm, friendly staff!! I would recommend anyone who is going to Bangkok to stay here, you will not be disappointed! It is right opposite the Hua Lumphong train station, so it is in a perfect location, for a quick stop in Bangkok. We will write more soon.